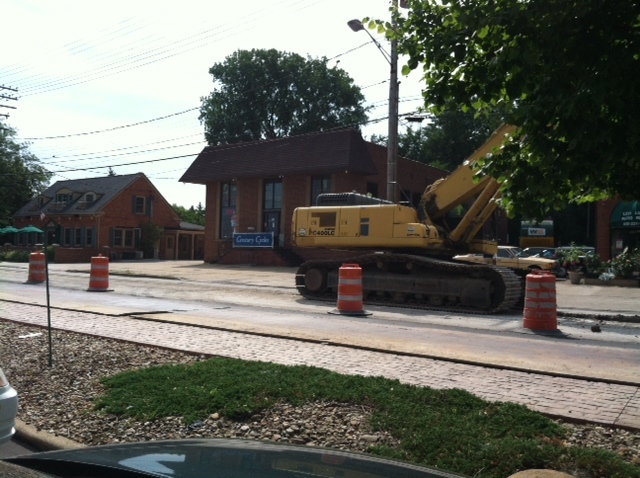 Construction has begun on Detroit Road and -- as you can see in the photo above -- it's occurring immediately in front of our Rocky River store. We apologize for the inconvenience and suggest you park in the plaza to our east, the one with FitWorks, Michael's Restaurant, Minotti's and the Dollar Store. That will help you avoid the worst of the construction traffic, and it is only a short walk from the store. To access that plaza coming from Lakewood and points east, just enter the driveway near Pet People, right after Starbucks. Park on the opposite side of the lot, near the UPS Store or Urgent Care. To access that plaza coming from Westlake and points west, we recommend entering the parking lot from the south. As you're heading east on Detroit Road toward our store, turn right on Lakeview, then turn left on Riverview (Rocky River Middle School is on the corner). Turn left on Hampton (the RR Library is on that corner), and continue on as it deadends into a driveway in to the parking lot. Park near the UPS Store or Urgent Care, and walk on over!